Surprisingly, amidst the hustle and bustle of celebrating my 73rd birthday yesterday, getting Episode Twenty in the Revelation series uploaded to the AIC’s You Tube channel, and servicing client accounts, I managed to complete and upload a Podcast Homily for the Thirteenth Sunday After Trinity. The Scriptural texts are Galatians 3:16-22 and Luke 10:29-37, the latter augmented by Luke 9:52-56 for context. I produced a longer commentary on the Parable of the “Good” Samaritan, with illustrations, in Episode 17 of our Bible Study series on the Gospel of St. Luke. You can watch the episode using the link at http://www.AnglicanInternetChurch.net/Bible-Study.html. 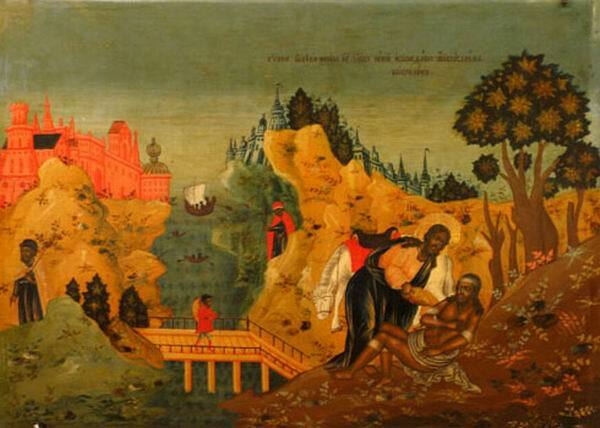 The Good Samaritan icon, Russian Orthodox Church, 18th Century. Public domain. The primary illustration is a very colorful Russian Orthodox icon from the late 18th Century. The homily focuses on the significance and symbolism of the six characters, which, in order of appearance, are the Lawyer, the Traveller, the Temple Priest, the Levite, the “Good” Samaritan, and the Innkeeper, according to the understanding of the early Church. The Bible Study version offers to additional illustrations, one from the Netherlands in the 18th C. and the Christ Pantokrator icon from the 6th C.
As of this episode, there are podcast homilies (or linked material) for each of the Sundays from First Sunday in Advent through Thirteenth Sunday After Trinity.